I am finding screen recording for systems training and particularly editing in SL3 quite cumbersome and time consuming to say the least. I am tempted to scrap all of my edited recordings and start over with static screenshots and hotspots, but I hate to throw away countless hours of work. Is there a good way to transform the View and Try Mode recordings into static clickable screenshots? I assume I just have to go in slide by slide and delete the mouse cursor item on the timeline and the screen recording action to make it static. The project I am working on has a very aggressive timeline and I have tons more to go. Any tips or advice would be welcome. 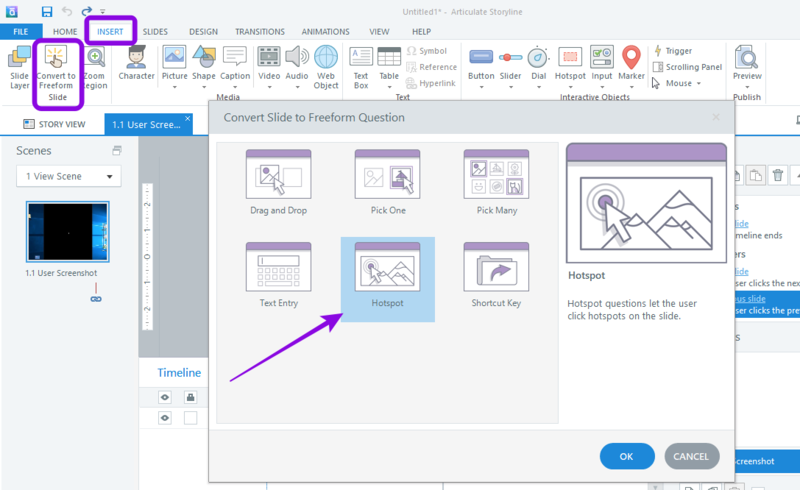 On the slides you wish to keep, you can easily convert them to a Freeform Slide and choose the Hotspot option. Yes, you will still need to delete the mouse cursor, but that may save you some time. Would a quicker method be to delete both the mouse cursor and screen recording action on the timeline? Or is the freeform method easier? I'd say converting to Freeform would be easier for me, as that way you'd have Storyline do the hard work of removing things while keeping the interaction in tact.